You talk Will, and I don't hear a thing. You ignore a dozen posters who have uploaded dozens of images in the new thread right here. Images that show many variations on EXPOSED "transitions". Most of them look really nice. No different than a Faun or a Satyrs "transition". I therefore conclude that you are one confused person. WHY are you HERE Will? What is it you want to actually SEE? If you happen to be looking for other vendors products that use some bulky kludge to hide the joining of human to horse, I wouldn't expect to see them in this thread. It isn't forbidden, the two are simply anti-themic to each other. I cannot see what it is you "Just have to hide" actually. What is it that bothers you in this method of joining human and horse to produce a centaur? I was just chatting. I will avoid that mistake again. That was a highly derogatory chat you had. NOW I will wander off and lurk. BUT!! It is so much easier to not stress out and be offended then it is to try and not offend, so PERSONALLY I think both of you ,yes both of you Will and McG need to get back here and start chatting any way ,this is the Centaur thread and we don't care whether we wear clothes or not!! 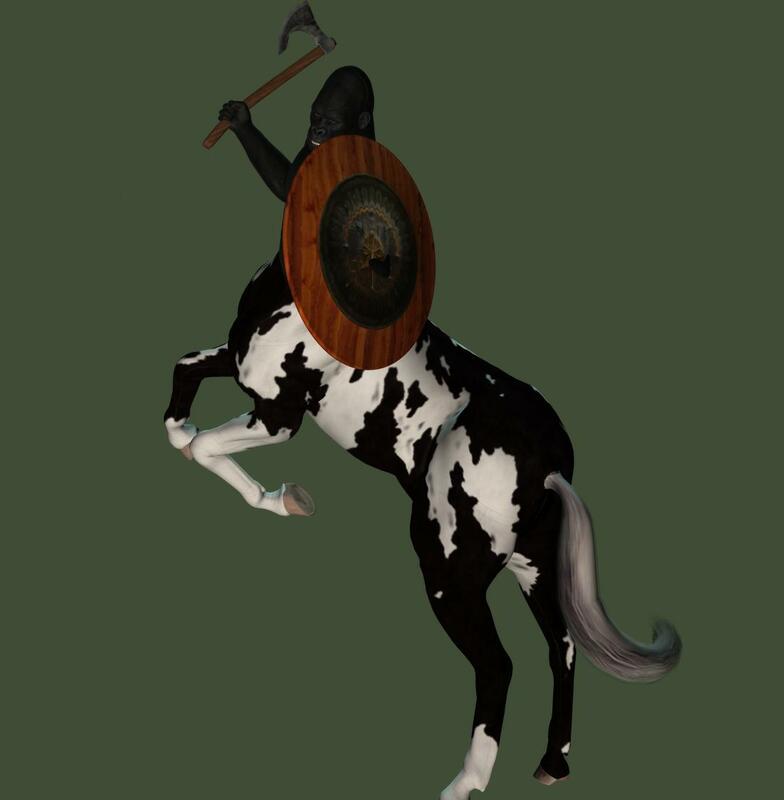 or what horse figure we use or human figure we use OR what software program we prefer ,we are going to create centaurs ,felitaurs,faunas and ENJOY ourselves!! Is that clear????? It has been fun! That sure looks like Girl4 Carrie! The androgynism of the mesh was a letdown for me, so I left Genesis 1 alone. Genesis 2 is better. But, I still HAVE all my Generation 3/4 stuff. Why invest even a nickel into just paying to do more of the same with all my same stuff? There is nothing "new" in this that does any useful thing for me. So I keep using the old stuff I have, and I am happy with it. I will keep on with HEMI's kits, and the Figures I have. I was definitely into polymer clay sculpting myself. Since I was a kid and found it as "Klean Klay" sold in the local dime store toy section. I bought it for my kids too, and they loved it. So, the kids made off with my big tin box of clay, now I have to buy some more. Heh! I enjoyed modeling living things, even fantasy critters. But human heads and expressions were the most difficult, and most rewarding subjects to work. I got into 3D via the games I was into. Doom, Quake, Unreal. I would edit the skins to make my own, and then used the same low poly modeler to tinker with the meshes themselves. It was learning by trial and error. Then an odd chance accident landed me at DAZ3D. I wasn't looking for anything 3D when I got here, but did register with the site and download my first D|S, a pre-version 1 in 2004. It came with just enough content to get me interested. And all the while, I was wondering "Well where the heck is the mesh modeler in it?!!?!" Another couple years, and DAZ ran a 'special' on a CP Partner sale. And I bought Poser 6 right here. Later, again via a CP Partner Sale here, I bought the Poser Pro/Modo bundle. It appears that pretty much ended DAZ partnering with other sites. CP was snapped up by SM and that was the end of peace. I have yet to master mesh modeling. I get too darn busy having fun playing with existing content in Poser and Vue! Yeah, I found it a tad more expensive overall than I initially figured it would be! But like you, I have had a lot of fun along the way! You don't care for the androgynism of Genesis1 ,and yet I totally enjoy being able to do male female or what not ,with the same figure,plus with Dimension3D's GenX ,to add ALL of the morphs from Generation 3&4 toGenesis (or Genesis2) I can actually recreate all the characters I had created in Generation4 ........ So it's very much to each their own kinda thing.I have reached a point where I'm becoming less interested in buying more stuff with the big push that is being done with IRAY ,I like 3Delight ,and I really have no need to make more realistic renders. I love polymer clay,didn't have the patience with ceramic clay ,the mess the waiting for a piece to fire ,etc.but polymer is great!! I am hoping to have more time to sculpt after the first of the year,gonna try and see if I can sell enough to suport myself ,and become the happy starving artist!! I bought Poser Figure Artist ,and it frustrated the heck out of me ,a few months after that I found DAZ ,and the the UI seemed to make more sense to me ,been playing ever since.Having a great time even when frustrated enough I want to punch the computer out !! Awwww come on guys............ oh pooo. Well then I guess I'll talk to myself, so McG I used modeling clay like Klean Klay as a kid did an entire zoo with it,with people and everything ,also made a pair of dauscunds with it that my mother still has ,and over the years they have grown their own fur coats,it is a dust coat but it looks a bit like fur.Polymer clay is similar but different, cause it works as easy as modelling clay,but you actually bake it in a regular home oven(or a toaster oven) to cure it/harden it .I make fat nekked fairies,leprechans in tea cups,dragons ,mermaids,fauna,centuars ,you can make an amature to help support it and actual bake it inside the polymer ,cause there is no shrinkage,so you can imbed glass beads,plastic anything that can withstand a temp of around 275f .I use all kinds of stuff so I guess I would be a multi-media artist ......just not a 3d modeler ....oh well . Sorry Carrie, I don't keep a regular sleep/wake pattern. Gave that up after my "big Op" and that allowed me to blissfully sleep whenever *I* need to. When I am tired, I rest, when I am sleepy I sleep. Makes keeping appointments difficult. I am a cancer survivor since July 2013. Missing some internal organs now. I am also tending a my 6 year old cat, allergy inj's weekly and twice daily oral meds and eye ointment. He is VERY understanding, and allows me to "pappoose" him in a heavy towel first. He has an abcessed tooth, and he is in pain. He's my buddy, I love him. I'll do my best to take good care of the three of my cats, God bless us! So that is where I went in our conversation. I did not forget you Carrie! yeah felt like a twist to the Centaur, someting new ? or just forgotten ? You did it. You cut up his brain, you bloody baboon! I wish you'd have shown the join. Just from what I can see, the Gorilla is located too low in the neck. Gorillas themselves are a species in transition from quadruped to biped, so their bellies resemble a pot bellied human and a hanging gut like any quadrupeds. Though the gorillas is thickly muscled, not normally fat like a humans gets. So, a Gorillataur will be more difficult to get looking great than human, which HEMIs kits were built for. I had messed with the dials so much I forgot where I was at, one thing that threw me off, didn't catch right off . . . was the mane, I thought it was a strange deform result, till I realized it was just the Mane. yeah the Pot belly was making it tough to scale in, and I was in a rush. in one angle the gorilla looked too high, and in another it looked too low. what looked bad was the Collide between the 2. I guess instead of gaming tonight I could spend more time and effort, I'll start a new one. okay didn't jump ahead like the first attempt, spent some effort. I might be able to move to Hex and might be able to fix that one bad spot, just startedd in Hex, so not sure if I'll be successful as much as I would like to be. I used the morph dials I have for Genesis to get it to fit better. I haven't parent GenesisGorilla to MilHorse yet in these renders, also I didn't do 100% gorilla body, just the head and just scaled down the head and neck to better match the body size. played alittle more, getting that time of night for me, this is the point I reached, some strange thing happening when posing genesisGorilla, had to leave in a T-Pose for the renders. NOW NOW NOW ALL HANDS! Zero seven hundred, an hour past revillie! UP UP ALL HANDS, rise and trice up all lower racks, breakfast is now served on the mess deck! UP UP ALL HANDS and Turn TO! The watches are stood around the clock, weekends included. I dare say 110 men would go through a ton of coffee grounds every patrol (one month). LOL! Forty years since I heard THAT piped over the ships comms! Ah me, and I *almost* miss that. Well I sure miss someone else cooking breakfast for me, and the cooks we had really did love cooking, and they loved hearing how we enjoyed their work. We ate well indeed. I would love to find a 3D model of a Coast Guard 327' Secretary Class Cutter. Only seven were built, one, the Hamilton, lost by torpedo to a U-Boat in the North Sea. All served a distinguished history. Could you just imagine a Centaur charging up from below decks, or standing lookout watches above the flying bridge? Heh! Even with all the work we did, all the watches we stood every day, we found plenty of time to be bored. Something like this 3D stuff would be excellent cause for having a well appointed laptop! But on watch, there better be Service Work being done on them! I am pretty sure that Radarmen, Quartermasters and even Boatswains will still be required to perform the "SAR Problem" on paper, out loud and quick as possible, no computer. The reason, we have to KNOW all the steps of the entire book that IS the Search and Rescue Problem, so if something were to happen to the ship board computers, ever person involved in the SAR will KNOW what to do without having to look it up. It is just one of the many things required of RD's and OS's in every branch of the US Military. Safety First is the first axiom of every service member today, after that, THEN the branch motto! Centaurs on a Carrier! Gee, can we adapt fighter jets for Centaurs?!? Space Shuttles? Hmmmm! See, inspiration comes from just seeing something new like a Gorillentaur! I have a number of 3D spacecraft what will enjoy being graced by the presence of 'Taurs! Yeah it kinda does. RKO Pictures, remember those? On every Wednesday and Saturday evening on PBS for a bunch of years. Gee you got more beard than I do Santa! I definitely grok the mileage. I spent all my work life doing maintenance, except for the military years. I recall getting excited at the prospect of having computers on the ships. But that didn't really get going till I was already out a couple years. And so in the late 70's I started playing with digital electronics, chips and logic circuits, making little light shows and stuff. Getting a good understanding of what and how, but not so much of the why. Should have gone to college I think! I still feel the yearning to draw and paint stuff on the pc screen, and get a lot of satisfaction in doing that. Its fun loading a prop into CS4E and painting right on the mesh. But its faster doing in layers in PSP or PS, then doing a look-see in 3D in Poser or Studio. I remember you vanished from the forums for awhile ,so congratulations on being a survivior ,it seems to me if you are still alive ,then the organs you are missing must not have been super important ,and I'm glad you are still hanging in there!! Klean Klay is a modeling clay ,it is a plasticine clay which will never get hard ,it'll get stiff and hard to work with when it's cold ,but it doesn't stay that way.If you put polymer clay like Fimo,Sculpy ,or Cernit (just to name a few brands) in the micro ,they would start to harden up and become unworkable.The micro isn't recommended to cure polymer clay cause it does heat evenly through the clay.I think you might enjoy working with poylmer ,you can get it on line or in any craft store or even WalMart. Well it's good to see somebody just monkeying around!! Okay while this link has nothing to do with Centaurs it does tickle my funny bone and put me in a better mood and get me ready for the **&#[email protected]#$*@( holiday season !! Hey you GO girl! The worst you could do is NOT try that! I admit I do it for fun. I am blessed to see all 4 of my kids grown and gone out on their own, 14 grandkids, one of em married now at 20. When SHE was born is when I started using McGrandpa as my handle everywhere. At the time, seems nobody else was, so I got in with just the name, no numbers. The first one at Hotmail! LOL! I was told my art wouldn't support anything too. Not that I cared too much about that, as my interest was the pleasure of DOING it. :) In The Beginning, I turned out some amazing images. Amazingly AWFUL that is! I had yet to look at this stuff as an actual 3D 'stage'. When I did finally, it instantly improved my posing tremendously. I WAS doing everything as though it was a 2D image, no flyarounds, no posing camera, etc. And when I did accidentally move the camera (Tattoo, the 6 year old tabby) decided it was time for HIM to play with the mouse. He batted it a few times never looking at the screen. But the scene was doing whirls and flip flops. When it stopped, the whole thing kinda went "DING!" and all I could say was "OH!" and start putting things where they should go for 3D. DUH! See, I came a learning, and I still learn new things every time I use the 3D stuff. It was a challenge for me to get posing of the Centaurs to look natural, as if they are really there. Their flow of motion has to be every bit as believable to any viewer as ALL Figures do. I did do one thing right long before I lost that 1 terabyte hd full of installed Runtime content. I saved out "Morph Poses" of most of my characters. That I did that for a bunch of my Centaurs makes me feel a bit better! LOL! Your dogs are so lucky! My eldest cat, Tattoo (bengal breed, brown marble tabby) has allergies real bad. The Vet suggested getting him tested at the Heska Labs. But it would be expensive. It wasn't really that high. But we did that, the results came in a couple weeks later. He is allergic to a page and a half of stuff, list format, two columns. Fleas and some kind of blooming weed were at the top of the list at 600+ which means horribly sensitive to the items. They also sent his first set of serums, which he has now had all of, and is on a new vial now. For the moment his dose is weekly and only 0.2 ml. Yeah I have to give him a 'scruff skin shot'. And he takes that better than the oral squirt in mouth antibiotic! Poor guy. I hate it that he is miserable. I think I could get a bunch of pics of "My Three Sons" and create MilCat skins for em. Heh! Now look at that; 11 years of collecting 3D stuff, and I am still using DAZ MilCritters. That's ok, they're good Figures and still work fine! I thank you for the comment on my survivorship. Things were real weird for a while, but I adjusted, and am used to dealing with the results now. I was offered my life indefinitely, or possibly a year without treatment. I didn't much care for that last one, so opted for all the treatment they could give. They did and I am over two years out from the surgery, still get tired pretty quick, sleep more, but generally feel better overall. I quit smoking over 5 years ago, and will not touch tobacco again. I wish now I'd never even started. SO. I do what I can as I can! I do not push myself as hard as I did a year ago. Finally realized it is a truly higher quality of life if I am enjoying being alive. There are a few other people that disagree with that, but they aint the ones had the cancer. I will check out that plasticine clay at WallyWorld store online. I want a couple of colors I never see in the walk in stores. Will let ya know what I get! There are a number of artists who work in polymer clay who work some of the local crafts shows. It seems to be particularly popular for things like an updated version of trade beads, as well as some wonderful stuff built into a tube and then sliced and baked as things like buttons and medalions. One can mix colors. But the colors won't bleed into each other if they are simply layered on top of each other. The colors tend to be quite vibrant -- although I suspect that may simply be the current trend. One probably could produce subtle colors from the stuff. I've several small bits of statuary done in it by an artist who is no longer working in the field. He did some very large and complex things over the years that he was working. Clay is simply another visual aid to what my mind is seeing. The hand-eye thing is important. I prefer to work in non-hardning plastic clay. Am looking through a few hundred items WalMart is offering. Yup yup those tubes are actually called canes,similar to glass canes and they can start out quite large and usually worked down to a smaller more usable size,but they can be very detailed ,they are even used for nail art the cane reduced baked and then slices are taken off and put on to finger nails ,polymer is used for jewelry making ,beads ,dolls,all kinds of stuff. I like combining my 3d with polymer clay ,using DS to shape ,pose and accessorize my ideas ,and then use that as a model to work from into the clay .........it's great fun! !